The number of loops listed assumes that cupid stitches are started 3 loops apart. Net 3 knots in next loop, net 3 knots in next loop, net 1 knot in each loop for 3 loops; repeat. Net 1 knot in each loop for 3 loops, *net 3 knots in each loop for 2 loops, net 1 knot in each loop for 3 loops*; repeat from * to *. Net 1 knot in each loop for 2 loops, *net 4 loops together, net 1 knot in each loop for 5 loops*; repeat from * to *. Net 1 knot in each loop for 4 loops, *net 4 loops together, net 1 knot in each loop for 5 loops*; repeat from * to *, ending net 1 knot in each loop for 4 loops. The amount of increase can vary depending on how close the cupid stitches are placed in round/row 1, (sample has them start 3 loops apart) and how many rows are done with the cupid stitch. Number of loops needed in round/row to begin stitch varies depending on how close the cupid stitches are placed in round/row 1. For circular netting this stitch requires a multiple of 2 loops plus the number of loops between the cupid stitches (eg. 2 + 3=5). 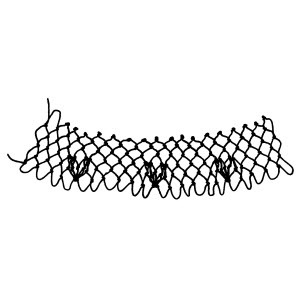 For diamond mesh netting this stitch requires the same number as for circular netting plus the number of loops between the cupid stitches (eg. Multiple of (2 + 3) + 3=8, or 13, or 18).